Energy recovery includes any technique or method of minimizing the input of energy to an overall system by the exchange of energy from one sub-system of the overall system with another. The energy can be in any form in either subsystem, but most energy recovery systems exchange thermal energy in either sensible or latent form. In some circumstances the use of an enabling technology, either diurnal thermal energy storage or seasonal thermal energy storage (STES, which allows heat or cold storage between opposing seasons), is necessary to make energy recovery practicable. One example is waste heat from air conditioning machinery stored in a buffer tank to aid in night time heating. Another is an STES application at a foundry in Sweden. Waste heat is recovered and stored in a large mass of native bedrock which is penetrated by a cluster of 140 heat exchanger equipped boreholes (155mm diameter) that are 150m deep. This store is used for heating an adjacent factory as needed, even months later. An example of using STES to recover and utilize natural heat that otherwise would be wasted is the Drake Landing Solar Community in Alberta, Canada. The community uses a cluster of boreholes in bedrock for interseasonal heat storage, and this enables obtaining 97 percent of the year-round space heating from solar thermal collectors on the garage roofs. Another STES application is recovering the cold of winter by circulating water through a dry cooling tower, and using that to chill a deep aquifer or borehole cluster. The chill is later recovered from the storage for summer air conditioning. With a coefficient of performance (COP) of 20 to 40, this method of cooling can be ten times more efficient than conventional air conditioning. A common application of this principle is in systems which have an exhaust stream or waste stream which is transferred from the system to its surroundings. Some of the energy in that flow of material (often gaseous or liquid) may be transferred to the make-up or input material flow. This input mass flow often comes from the system's surroundings, which, being at ambient conditions, are at a lower temperature than the waste stream. This temperature differential allows heat transfer and thus energy transfer, or in this case, recovery. 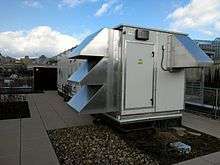 Thermal energy is often recovered from liquid or gaseous waste streams to fresh make-up air and water intakes in buildings, such as for the HVAC systems, or process systems. Energy consumption is a key part of most human activities. This consumption involves converting one energy system to another, for example: The conversion of mechanical energy to electrical energy, which can then power computers, light, motors etc. The input energy propels the work and is mostly converted to heat or follows the product in the process as output energy. Energy recovery systems harvest the output power and providing this as input power to the same or another process. An energy recovery system will close this energy cycle to prevent the input power from being released back to nature and rather be used in other forms of desired work. Heat recovery is implemented in heat sources like e.g. a steel mill. Heated cooling water from the process is sold for heating of homes, shops and offices in the surrounding area. Regenerative braking is used in electric cars, trains, heavy cranes etc. where the energy consumed when elevating the potential is returned to the electric supplier when released. Active pressure reduction systems where the differential pressure in a pressurized fluid flow is recovered rather than converted to heat in a pressure reduction valve and released. In 2008 Tom Casten, chairman of Recycled Energy Development, said that "We think we could make about 19 to 20 percent of U.S. electricity with heat that is currently thrown away by industry." A 2007 Department of Energy study found the potential for 135,000 megawatts of combined heat and power (which uses energy recovery) in the U.S., and a Lawrence Berkley National Laboratory study identified about 64,000 megawatts that could be obtained from industrial waste energy, not counting CHP. These studies suggest about 200,000 megawatts—or 20% -- of total power capacity that could come from energy recycling in the U.S. Widespread use of energy recycling could therefore reduce global warming emissions by an estimated 20 percent. Indeed, as of 2005, about 42 percent of U.S. greenhouse gas pollution came from the production of electricity and 27 percent from the production of heat. Lack of efficient technologies for private homes. Heat recovery systems in private homes can have an efficiency as low as 30% or less. It may be more realistic to use energy conservation like insulation or improved buildings. Many areas are more dependent on forced cooling and a system for extracting heat from dwellings to be used for other uses are not widely available. Ineffective infrastructure. Heat recovery in particular need a short distance from producer to consumer to be viable. A solution may be to move a large consumer to the vicinity of the producer. This may have other complications. Transport sector not ready. With the transport sector using about 20% of the energy supply, most of the energy is spent on overcoming gravity and friction. Electric cars with regenerative braking seem to be the best candidate for energy recovery. Wind systems on ships are under development. Very little work on the airline industry is known in this field. ↑ Wong B., Thornton J. (2013). Integrating Solar & Heat Pumps. Renewable Heat Workshop. ↑ Paksoy, H.; Stiles, L. (2009), "Aquifer Thermal Energy Cold Storage System at Richard Stockton College", Effstock 2009 (11th International) - Thermal Energy Storage for Efficiency and Sustainability, Stockholm. ↑ 'Recycling' Energy Seen Saving Companies Money. By David Schaper. May 22, 2008. Morning Edition. National Public Radio. ↑ Bruce Hedman, Energy and Environmental Analysis/USCHPA, "Combined Heat and Power and Heat Recovery as Energy Efficiency Options", Briefing to Senate Renewable Energy Caucus, September 10, 2007, Washington DC. ↑ "Clean Energy Technologies: a Preliminary Inventory of the Potential for Electricity Generation, Lawrence Berkley National Laboratory, 4/05" (PDF). ↑ "The Energy Information Administration, Existing Capacity by Energy Source, 2006". ↑ "Inventory of U.S. Greenhouse Gas Emissions and Sinks". U.S. Environmental Protection Agency. ↑ "Emissions of Greenhouse Gases in the United States 2005". U.S. Energy Information Administration,. 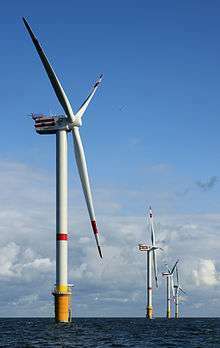 Wikimedia Commons has media related to Energy recovery.